Just a quick click takes you to our athletics calendar. Come on out and cheer on SJS! Our sports program complements the academic program. It is a means of living our philosophy which emphasizes the all-around development of the student. We recognize that a healthy body and a healthy mind work together to produce a well-rounded person. We encourage our students to participate in our athletic programs. Participation allows them to develop the ability to listen to directions, to follow them accurately, to put others’ needs before one’s own, and to come up a winner, even in the face of defeat. This is open to students in the 5th through 8th grades. JV is open to students in the 5th and 6th grades. Varsity is open to students in the 7th and 8th grades. This is open to students in the 2nd and 3rd grades. This is open to students in the 4th through 8th grades. This is open to students in 3rd and 4th grades. This is open to students in the 1st and 2nd grades. This is open to girls in the 6th through 8th grades. Our athletics committee funds and supports our sports program. We accomplish this through registration and admissions and other fund-raising activities during the sports seasons. At the end of each school year, we recognize all the students who participated in extra-curricular sports. 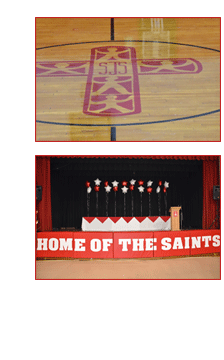 We require students to maintain all passing grades to participate in any of the athletic programs of St. James School. In the event of academic failure, we will remove the student from the sports program effective on the date we issue the report card. We will reinstate students who successfully pass all subjects at the issuance of the next report card. We do not permit students who miss class on Friday to participate in games held on Friday evening. Our athletics committee meets the first Tuesday of the month at 6:30 p.m. in the school cafeteria. These meetings are open to everyone.